It took me two days to process the enormity of the systematic starvation of the children of Yemen in the Middle East leading to thousands of deaths of the innocents even as the world watches in cruel silence. Yemen, one of the Arab world's poorest countries, has been devastated by a civil war, so says the famous British Broadcasting corporation online version. The BBC correctly recalled that the conflict has its roots in the failure of a political transition supposed to bring stability to Yemen following an Arab Spring uprising that forced its longtime authoritarian president, Ali Abdullah Saleh, to hand over power to his deputy Abdrabbuh Mansour Hadi, in 2011. President Hadi struggled to deal with a variety of problems, including attacks by al-Qaeda, a separatist movement in the south, the continuing loyalty of many military officers to Mr. Saleh, as well as corruption, unemployment and food insecurity. The Houthi movement, which champions Yemen's Zaidi Shia Muslim minority and fought a series of rebellions against Mr. Saleh during the previous decade, took advantage of the new president's weakness by taking control of their northern heartland of Saada province and neighbouring areas. Disillusioned with the transition, many ordinary Yemenis - including Sunnis - supported the Houthis and in late 2014 and early 2015, the rebels took over Sanaa. The Houthis and security forces loyal to Mr. Saleh - who is thought to have backed his erstwhile enemies in a bid to regain power - then attempted to take control of the entire country, forcing Mr. Hadi to flee abroad in March 2015. Alarmed by the rise of a group they believed to be backed militarily by regional Shia power Iran, Saudi Arabia and eight other mostly Sunni Arab states began an air campaign aimed at restoring Mr. Hadi's government. The coalition received logistical and intelligence support from the US, UK and France. These much were reported by the number one publicly owned United Kingdom's media conglomerate. Whilst still processing this extensively demoralizing and cruel information that the war in Yemen is weaponised by Western powers and that Saudi Arabia stepped into the fray only because Iran backed one of the factions in the then internal political warfare, another devastating news arrived from the Western media that so far 85,000 children in Yemen have died from starvation occasioned by the needless war which is been fueled by Iran, Saudi Arabia. Saudi Arabia too is making use of weapons it bought from U.S.A; Britain and other world powers. What immediately occurred to me was to ask why the United States of America has allowed history to repeat itself. Why would America be involved in fueling such war that has serious consequences to the lives of innocent children when it is on record that America single handedly rebuilt Europe from the devastation of the World War II? It looks like in international politics when things seems to have normalized certain belligerent attitudes of some weird political stakeholders would once more reignite the toxic warfare that took place many years ago and especially the one that ended in 1945 resulting in the global intervention of the USA through the Marshall plan that successfully reconstructed the then devastated Europe. I got detailed expert renditions of how the United States carried out the Marshall plan. War historians states that by the end of World War II much of Europe was devastated. A large portion of the 60 million deaths among World War II casualties were residents of Europe. As they recalled, fighting had occurred throughout much of the continent, encompassing an area far larger than that in World War I. These historians told us that sustained aerial bombardment meant that most major cities had been badly damaged, with industrial production especially hard-hit. Especially damaged in the opinion of these analysts was transportation infrastructure, as railways, bridges, and docks, which had been heavily targeted by air strikes, while much merchant shipping had been sunk. “The united nations also launched a series of humanitarian and relief efforts almost wholly funded by the United States. These efforts had important effects, but they lacked any central organization and planning, and failed to meet many of Europe’s more fundamental needs. Already in 1943, the United Nations Relief and Rehabilitation Administration (UNRRA) was founded to provide relief to areas liberated from Axis powers after world war II. UNRRA provided billions of dollars of rehabilitation aid, and helped about 8 million refugees. It ceased operations in the DP camps of Europe in 1947; many of its functions were transferred to several UN agencies”. We will now proceed to read about the high casualty figures from the Yemeni war as regards the position of children. abcnews.go.com reports that approximately 85,000 children under the age of 5 have died in Yemen from severe hunger since April 2015, according to a new report from Save the Children. Using data gathered by the United Nations, Save the Children looked at the mortality rate of children under 5 years old who were treated for severe acute malnutrition and calculated that close to 85,000 of them have died between April 2015 and October 2018. "Children are usually the most vulnerable in situations of famine or emergency food security and are particularly susceptible to malnutrition. Diseases easily pray upon their weakened immune systems," Tamer Kirolos, Yemen director for Save the Children, told ABC News in an email. He added that 5.2 million Yemenis children are at risk of famine. "We cannot stand idly by and do nothing. The world needs to act," he said. In a briefing in October, Mark Lowcock, the United Nations Under-Secretary-General for Humanitarian Affairs and emergency relief coordinator, said nearly 14 million people in Yemen -- or about half of the country’s population -- are facing pre-famine conditions. However, a direct question to the United Nations is this: why watch on helplessly as war crimes are committed in Yemen? Justice Emmanuel Ayoola, a former Justice of the Supreme Court of Nigeria has this to tell us about the implications of letting crimes against humanity go on. He wrote that crimes against Humanity has eleven acts that qualify each crime as war crime and these are classified and criminalized as crimes against humanity. Only murder, he however stated will be mentioned here. His words: "For the purpose of the statute, ‘crime against humanity’ means the act of murder or causing death when committed as part of a widespread or systematic attack directed against any civilian population, with knowledge of the attack. ‘Attack directed against any civilian population’ means a course of conduct involving the multiple commission of acts such as murder, etc. referred to in Article 7(1) against any civilian population, pursuant to or in furtherance of a state or organizational policy to commit such attack. That the policy could be that of a non-state actor is generally accepted. Such crimes can be perpetrated by terrorist groups, criminal gangs or groups or so-called ethnic militia." “In countries where civil strife is prevalent, there is much to be learnt about the salutary significance of the new international regime of criminal international law whose machinery is not hampered by those factors and considerations that weaken national judicial and law enforcement institutions, hamper them in their operations and hinder their resolve to be an instrument for the termination of impunity", Justice Ayoola noted. The salutary significance of the aforementioned is that the main purpose of the expanding frontiers of justice is to ensure that those who bear the greatest responsibility for genocide and crimes against humanity are not only nationally made accountable, but also internationally accountable for their conduct. Britain is a party to the Rome statute that created International Criminal Court but it is deeply involved in supplying weapons that are being put to use in the genocides going on in Yemen. The USA is not a party to the Rome treaty on ICC but parades about as the conscience of the international community and a big player in the Security Council of the United Nations. Why is America selling weapons to the repressive autocrat in Saudi Arabia who in turn deploys these weapons of mass destruction to kill of the babies of Yemen? The World must stop this cruelty against Yemeni babies. Enough of the war crimes. 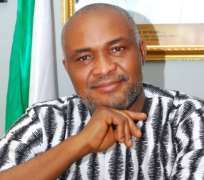 *Emmanuel Onwubiko is head of Human Rights Writers Association of Nigeria (HURIWA) and blogs @ www.emmanuelonwubiko.com ; www.huriwanigeria.com ; www.huriwa.blogspot.com .